If you spend as much time on the Internet as I do, you might have come across Rage Comics. It started on 4chan, became hugely popular on reddit and is now hitting mainstream via sites like 9gag. It features a homogenous group of “characters” and people create their own stories or “rages” using an online editor. Suffice to say it might just be the first continuous user-generated comic strip. The comics are usually humorous views and over-exaggerated perspectives on life and experiences. I read these comics quite often as they are funny and almost banal in their view on life. Not only that, but it’s created by anyone. I’ve been looking for these kind of comics in Chinese for some time and at last found good source for them. Welcome Baozoumanhua. Be warned though. Some of these comics are very NSFW! The one above is hilarious. Not only that, but it uses very clever wordplay. 奥巴马 (Obama), 米老鼠 (Mickey Mouse) and 唐老鸭 (Donal Duck) are all proper names. The guy on the left keeps asking what animal usually has four legs, like a 马 (horse) and 老鼠 (rat) and reveals a person’s name, but plays a joke by asking what 鸭子 (duck) has two legs. You expect to name a proper name, like Donald Duck, but reveals that all ducks have two legs. Clever! 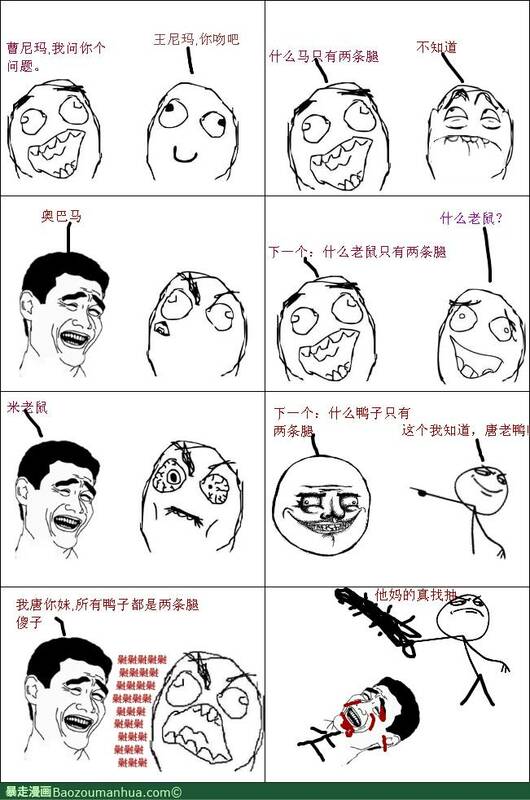 Rage comics usually use very unique language, so it might be a bit of a learning curve, like a guy is usually called Derp (王尼玛) and a girl Derpina (王尼美). Swear words are common too (操, 他妈的 etc). I’m sure these comics are not for everyone. Like I said, some of them are very crass and NSFW, but hey, if you’re looking for an alternative way to practice your Chinese reading, then why not?